‎It’s encouraging that the UK campaign against female genital mutilation (FGM) has now become actively embraced by people from many sections of society. Amongst the media to take up this message is Islam Channel Television, which has twice in early 2014 offered Analysis programmes on the subject. With others from varying perspectives I made a contribution to these broadcasts, which are now available to view. The introductory texts and links to these programmes are given below. As the pressure to end FGM on girls in the UK mounts, just how prepared is Michel Gove to support the Guardian led campaign to end the practice by supporting the teaching of the subject into schools? Despite governmental efforts to criminalise FGM under the 1985 prohibition act that was upgraded by the 2003 FGM Act; the practice remains very much alive and endemic. The campaign, headed by 17 year old Fahma Mohammad, seeks to step up pressure on education establishments, urging head teachers to inform pupils and parents of the horror’s FGM causes. A petition published online last Thursday to mark the International Day of Zero Tolerance to Female Genital Mutilation, received 100,000 signatures only 24 hours after it was placed online. Yet an estimated 24,000 women and girls living in the UK have been subjected to the practice. Though some may justify FGM under the claim that it classifies to be a religious obligation, no holy scripture, whether Islamic, Christian or Jewish, advocate for it to be carried out, implicitly or explicitly. Yet can the struggle to combat FGM be ended within a generation? Can the struggle be simply fought in the classroom, or are we expect to see it extend beyond? And just how will ministers from the departments of health, education and international development respond to end an act tantamount to child abuse. Joining Jonathan Steele in the studio are Hilary Burrage, Consultant Sociologist and currently writings a book on eradicating FGM from a UK perspective, and Sheikh Abdullah Hasan from Imams to End Domestic Abuse. And On Skype we are joined by Anela Anwar the head of projects at Roshni, based in Glasgow. Although FGM has been illegalised since it became an offence under the UK Prohibition of Female Circumcision Act in 1985, it remains seen as a deeply rooted tradition performed by various communities in the UK and abroad. The FGM Act of 2003 modified this law by making it illegal for FGM to be carried out on UK citizens overseas, thereby closing the legal loophole that allowed perpetrators to escape the justice system. Those found guilty can face up to 14 years in prison. However, to date, there have been no successful prosecutions, and its performance on young women and girls remains prevalent. The practise itself reflects a form of physical, emotional and psychological violence carried out against women in the context of power of control. So what can be done to strengthen the enforcement of these legislations? How might law enforcement against FGM in the UK compare to that in countries elsewhere? And what can the police and the National Health Service do to identify potential victims and help those affected? We are rejoined by consultant sociologist Hilary Burrage. We are also joined by Comfort Momoh, founder of African Well Women’s Clinic. On Skype we are joined by Naana Otoo-Oyortey, MBE & Executive Director of FORWARD. And on the phone by DCI Jane Scotchbrook from the Metropolitan Police. Hello and welcome to Analysis, with me John Rees. An estimated 24,000 women and girls living in the UK have been subjected to the practice of FGM — female genital mutilation, or, to its defenders — female circumcision. A recent campaign by A-Level student, Fahma Mohammad, backed by the Guardian, sought to encourage schools to educate pupils about FGM. The campaign’s petition generated more than 100,000 signatures in less than 24 hours of being launched. The petition later reached nearly a quarter of a million signatures and saw the government write to every school in England warning them to be alert to the dangers of FGM. The government has also sought to use the law against practitioners of FGM, but there have been no successful prosecutions to date. However, this could change after two people were charged by the Crown Prosecution Service following an investigation by police officers in the borough of Islington. They were charged under the Female Genital Mutilation Act of 2003 and the Serious Crime Act of 2007. So, is this a success for the campaign to rid the UK of FGM? We spoke to Dr Wanda Wyporska, Lead Equalities Officer of the Association of Teachers and Lecturers, who has been active in raising awareness about FGM, for her views. Joining John Rees to discuss FGM and the role played by schools, teachers and teaching unions are Hilary Burrage, a Consultant Sociologist who is currently writing a book called Eradicating Female Genital Mutilation: a UK Perspective; Sheikh Abdullah Hasan, an Imam at the Khadijah Mosque & Islamic Centre in Peterborough and a Trustee of Imams Against Domestic Abuse; On the phone we have Anela Anwar who is head of projects at Roshni, an organisation working with minority ethnic communities in Scotland; and on the line we have Dr Shuja Shafi, Deputy Secretary General and Chief Medical Advisor, The Muslim Council of Britain. 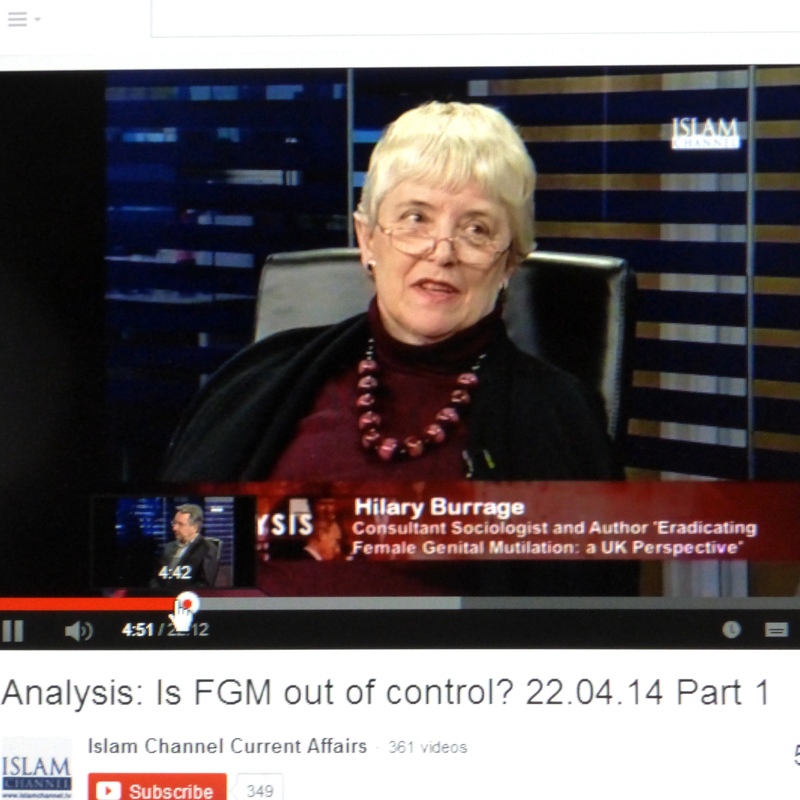 Welcome back to Analysis where we have been talking about FGM and efforts to fight the practice in the UK. We’ve been joined on the line by Amanda Koech, Communications Coordinator at World Vision Somalia. The #NoFGM Daily News carries reports of all items shared on Twitter that day about FGM – brings many organisations and developments into focus. Also available to follow is daily news from NoFGM_USA.